It was one in the morning in Seattle, Washington, when Aayah’s brother called her to say their parents had been taken. 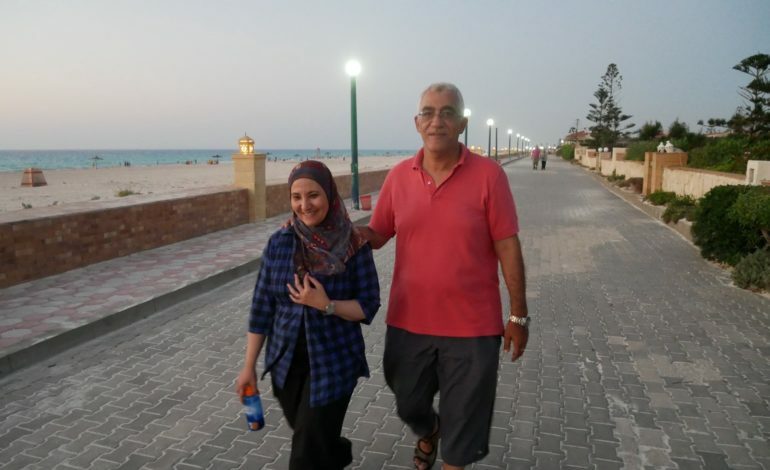 Ola Al-Qaradawi and Hosam Khalaf had been moving furniture around their summer house on the north coast of Egypt, a villa frequented by the family for breaks away from the city, when security forces entered, arrested them and took them away without telling anyone where they were going. For three days Aayah’s brother asked friends, family and contacts if they had heard from his parents. Then, by chance, a lawyer from Cairo called – he had seen Ola and Hosam in the State Security Prosecution’s building. The family’s lawyer went to them and reported back that they were being interrogated. Aayah’s parents had entered a pre-trial detention that would keep getting extended, yet from what the lawyer could make out there was no evidence at all. In 2013 Egyptian military backed authorities banned the Muslim Brotherhood after ousting it from power, labeling it a terrorist organisation and subsequently imprisoning hundreds of its members. Egyptians outside the party who are arrested arbitrarily and without evidence are regularly accused of being part of the organisation or of financing the group. Aayah is sure the target of the security forces is her mother because she is the daughter of the influential Islamic scholar Yusuf Al-Qaradawi, who has been cast as an opponent to the current regime and lives in exile from his native Egypt. Al-Qaradawi publically left the Muslim Brotherhood years ago, says Aayah, and although he once fronted a popular and influential TV show on which he spoke out in support of the Arab Spring and against the military coup, he hasn’t spoken publically for three years. Ola and Hosam have become part of a wider geopolitical conflict between Qatar – Al-Qaradawi’s home – and Egypt, which along with Saudi Arabia, the UAE and Bahrain, cut diplomatic ties with the Gulf state and imposed a land, sea and air blockade on the country weeks before their arrest. One of the demands for it to be lifted is that Qatar extradite Al-Qaradawi to Egypt. Ola holds Qatari citizenship but until the conflict ends it’s unlikely Qatar will be able to pressure the Egyptian authorities for her release. There is no Qatari embassy in Egypt, no relationship between the two countries and Egypt is denying Ola any of her rights as a Qatari citizen including consular visits, says Aayah. Family and her lawyer have also been denied access to Ola, so what Aayah knows about her condition is what the lawyer can gather from her appearances in court. Once, when she was brought before the prosecutor she fainted, he said, and described her condition as weak and deteriorating. The only time she has been allowed to speak she complained that another prisoner on her wing regularly attacks her verbally and physically. Ola has now passed the 300 day mark inside prison, where she is locked in a cell by herself for 23 hours a day, making her detention the longest amount of time a female prisoner has spent in Egypt in solitary confinement. She is kept on a different wing and attends hearings on different days to her husband and is only allowed out for an hour a day to use the toilet and stretch her legs in the corridor. In the lead-up to Ola’s arrest there was nothing to suggest that she was about to be targeted, says Aayah. She left Egypt, visited Qatar and the US several times, and always got back into the country without any problems. Ola’s husband, Hosam, has previously been targeted by authorities. Several years ago he was preparing for a trip outside Egypt when he asked around his contacts to see if he would be safe to leave. The answer came back as no. Hosam learnt that he had been placed on an unofficial no-fly list, which is generally reserved for people who oppose the government. “They don’t want them to leave the country and speak freely about their experience,” explains Aayah. In 2014 Hosam had been arrested along with other members of Al-Wasat Party and imprisoned though there was no investigation. After two years authorities declared they had nothing on him and let him go but still sought to prevent him from travelling. It had been a difficult few years, but after Hosam’s release, the family thought they were safe. Although Hosam still needed to find a way to leave the country, Ola had agreed to join Aayah, her son-in-law and two granddaughters in the US. They were preparing for her arrival by moving to a bigger house. Ola, who was reluctant to leave her husband after being without him for two years, only had one month left on her Green Card when she was arrested. Aayah’s children are devastated: “Sometimes they come and ask how is this fair, why would they even do this. It’s hard for kids to comprehend why adults do these things,” she says. Hosam grew up in America and both he and Ola completed their Masters there. It’s where Aayah and her brother were born before they returned to Egypt so naturally the family has turned to the US government for help. Despite the fact that President Donald Trump has been heavily criticised for his close relationship with Abdul Fattah Al-Sisi he also worked on the release of human rights worker Aya Hijazi, a dual citizen detained in May 2014. Many have presented her case as a glimmer of hope for Ola and Hosam – yes, says Aayah, but it did take three years for the US to get her out.